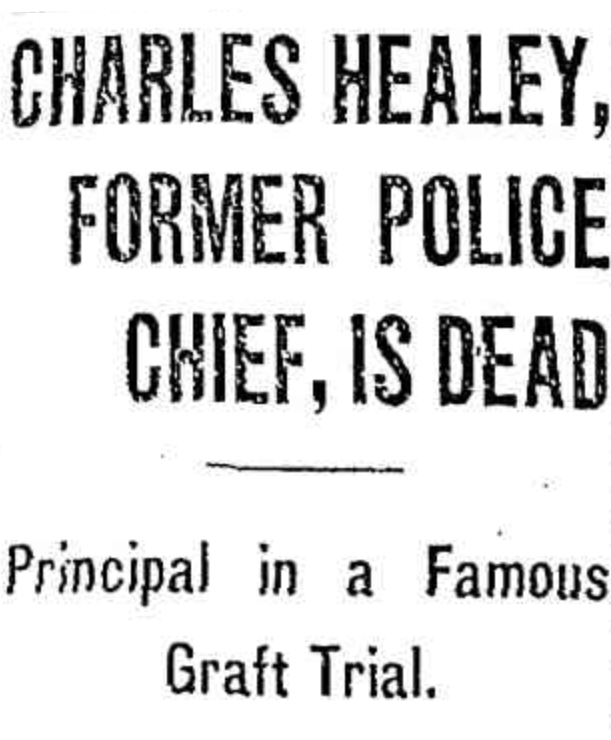 Charles C Healey, chief of police for the first two years of William Hale Thompson’s first term as mayor and and principal defendant in a celebrated graft trial six years ago, died yesterday after a lingering illness at the home of his son-in-law, Walter Hedrick, 6225 Woodlawn avenue. 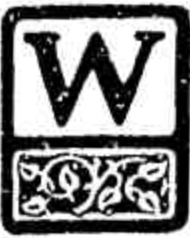 The former police official was 69 years old and is survived by his widow, Mrs. Nellie Healey, and a daughter, Mrs. Hendrick. According to attending physicians, Healey’s death was due to a complication of ailments reaching back over a period of seven years. He never permanently rallied from a stroke of paralysis in February, 1918, at the conclusion of his trial in Criminal court, it was stated. For nearly thirty years prior to his becoming enmeshed in a maze of graft charges in connection with his administration as general superintendent of police, Healey was known as an outstanding officer of the police department. He was regarded as one of the leading traffic experts in the country, and was founder and first commander of the department’s traffic division. On Oct. 23, 1916, Healey was indicted by a special grand jury on charges of criminal conspiracy malfeasance in office, graft, extortion, and omission of duty. 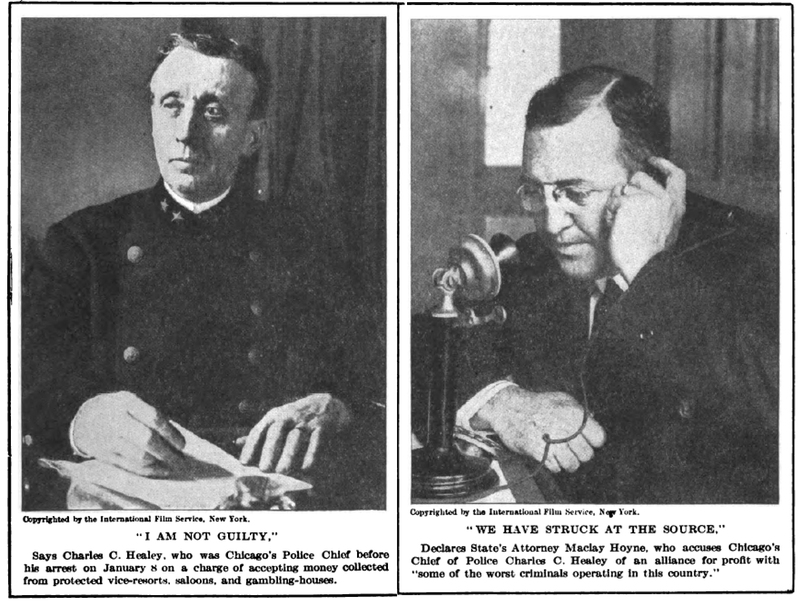 A year later Healey, along with William Skidmore, west side politician-saloonkeeper, and Detective Sergeant Stephen J. Barry, now a lieutenant, was brought to trial. After a bitter three months’ legal battle in Judge Sabath’s court, all three defendants were acquitted. Immediately afterward Hoyne announced a determination to bring Healey back into court on other indictments still pending, but upon testimony of physicians employed by the state to the effect that Healey was physically unable to appear, these charges were nolle prossed. Healey was born in 1856 and began his career in 1888 as a lieutenant in the old Town of Lake. He was made a captain of Chicago Police in 1906. Appointment as chief came with the election of Thompson in 1916. It has been a filthy combination of crooks, including almost every type of criminal known, from burglars, pickpockets, safe blowers to backmailers, firebugs, and extortionists. The Chief of Police and men associated with him have been in deliberate conspiracy with the vilest elements in Chicago.